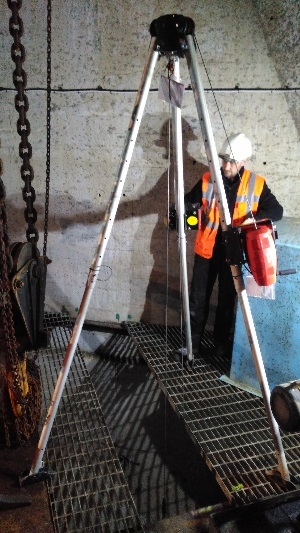 In March of this year, the Lloyds British Wednesbury Site Services team helped Severn Trent with a problem where-by they couldn't gain access to a confined space because of material loss to the original access ladders. After a site visit it was decided that the safest possible method for access and egress was to use a Tripod equipped with a goods winch and recovery block. Whilst Lloyds British has used traditional methods of rope access in the past on this occasion the inspectors involved required a method with safer control. It was with this information that the Lloyds team approached the team at Speedy West Bromwich Superstore for an alternative solution. With assistance from Carl Barton (depot manager) the team opted to use the Abtech Safety 30073 counterbalance davit arm alongside a Checkmate TR3 Fall arrest and load bearing tripod. The job took place over two days and was deemed a great success with the Lloyds team and customer both satisfied with the solution. This is part of an ongoing working relationship with Severn Trent, including rescue standby at Ladybower Reservoir in Derbyshire.